Current guidelines recommend that people with coronary artery disease (CAD) receive antiplatelet therapy with either aspirin or clopidogrel. 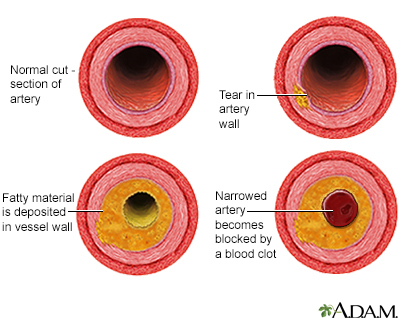 Aspirin therapy is very helpful for people with CAD or a history of stroke. If you have been diagnosed with CAD, your health care provider may recommend that you take a daily dose (from 75 to 162 mg) of aspirin. A daily dose of 81 mg is recommended for people who have had PCI (angioplasty). It is most often prescribed along with another antiplatelet medicine. Aspirin can reduce the risk for heart attack and ischemic stroke. However, using aspirin over the long-term can raise your risk for stomach bleeding. Daily aspirin should not be used for prevention in healthy people who are at low risk for heart disease. You provider will consider your overall medical condition and risk factors for heart attack before recommending aspirin therapy. Taking aspirin helps prevent blood clots from forming in your arteries and may help lower your risk for a stroke or heart attack. You do not have a history of heart disease or stroke, but you are at high risk for a heart attack or stroke. You have been diagnosed with heart disease or stroke already. You will most likely take aspirin as a pill. A daily low-dose aspirin (75 to 81 mg) is most often the first choice for preventing heart disease or stroke. Talk to your provider before taking aspirin every day. Your provider may change your dose from time to time. Before you start taking aspirin, tell your provider if you have bleeding problems or stomach ulcers. Also say if you are pregnant or breastfeeding. Take your aspirin with food and water. This can reduce side effects. You may need to stop taking this medicine before surgery or dental work. Always talk to your provider before you stop taking this medicine. If you have had a heart attack or a stent placed, be sure to ask your heart doctor if it is OK to stop taking aspirin. You may need medicine for other health problems. Ask your provider if this is safe. Call your provider if you have side effects. Call your provider if you have wheezing, breathing difficulty, or tightness or pain in your chest. Side effects include swelling in your face or hands. Call your provider if you have itching, hives, or tingling in your face or hands, very bad stomach pain, or a skin rash. Fihn SD, Blankenship JC, Alexander KP, et al. 2014 ACC/AHA/AATS/PCNA/SCAI/STS focused update of the guideline for the diagnosis and management of patients with stable ischemic heart disease. Circulation. 2014;130(19):1749-1767. PMID: 25070666 www.ncbi.nlm.nih.gov/pubmed/25070666. Ridker PM, Libby P, Buring JE. Risk markers and primary prevention of coronary heart disease. In: Zipes DP, Libby P, Bonow RO, Mann DL, Tomaselli GF, Braunwald E, eds. Braunwald's Heart Disease: A Textbook of Cardiovascular Medicine. 11th ed. Philadelphia, PA: Elsevier Saunders; 2019:chap 45.